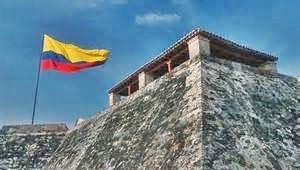 Cartagena’s incomparable San Felipe De Barajas Castle is the most important defensive complex built by Spanish military engineering in the New World. The massive defense complex is a mixture of tunnels, galleries, and uneven grounds and traps. It has an intricate system of communication and escape routes and an “ingenious weave of mines” designed to blow up if an enemy captured the fortress. During the 16th century, Cartagena was Spain’s principle colonial port. Conquistadors returning to Spain sailed from the port of San Felipe De Barajas with their ships full of gold and other bounty. 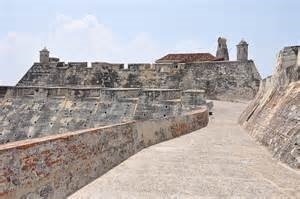 King Ferdinand commissioned construction of the Castillo de San Felipe de Barajas to defend his ships from pirates and English warships. “The castle took over 200 years and 245 tons of gold to build!” It’s designed to repel cannonballs by making them bounce off its exterior walls. During the last few days here in Cartagena I’m enjoying the friendly, happy people and the spectacular night lights in the walled city squares. Incredible and tasteful Christmas light displays are everywhere! Last night I forgot my camera but will take photos tonight and post them. The Archipelago of the Rosario Islands is also on the list to explore. It’s a 1.5 – 2 hour boat ride from Cartagena and the sun is very harsh. Since I got sunburned walking around, am waiting until it’s a little better. This entry was posted in Colombia and tagged Archipelago de las Islas del Rosario, Cartagena, Castillo de San Felipe de Barajas, conquistadors, King Ferdinand, San Felipe De Barajas by suemtravels. Bookmark the permalink.